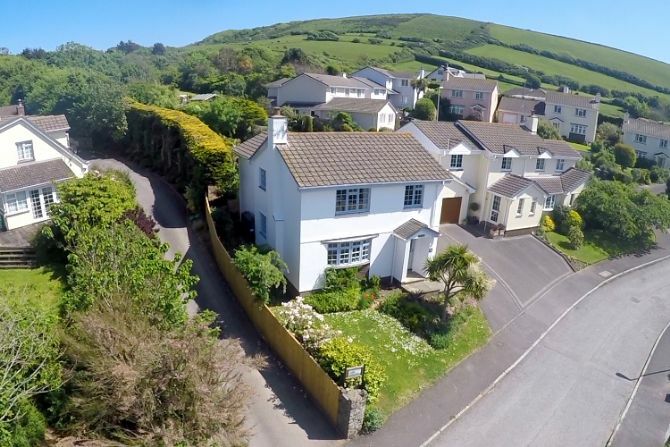 The WHITE HOUSE occupies a spectacular position in a quiet and peaceful location, yet is only a short walk from the heart of picturesque Croyde village and its many amenities. 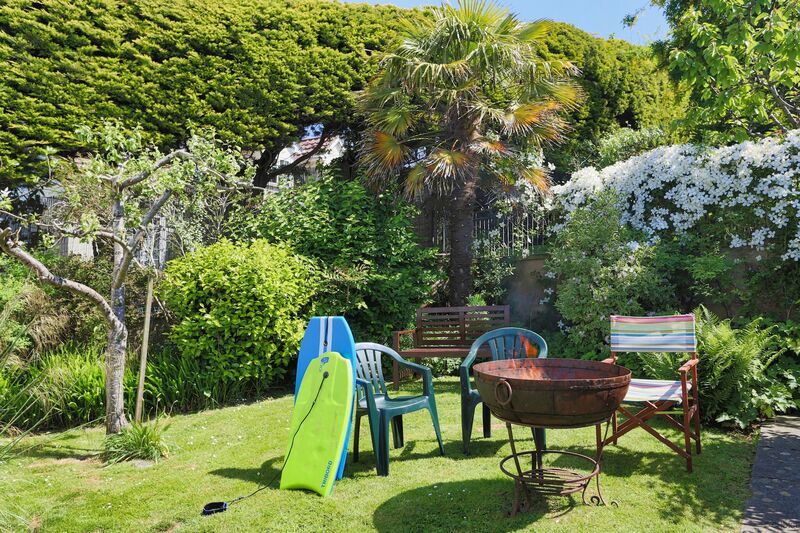 Best of all, this property is also within a few minutes walking distance from Croyde Beach and the sand dunes. The WHITE HOUSE is a beautifully presented house, equipped with all you require for a "home from home” experience. 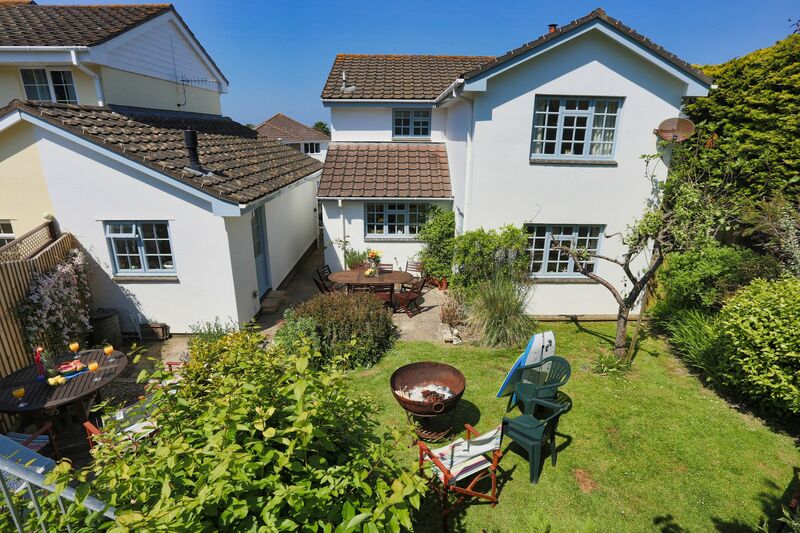 Comprising 4 bedrooms sleeping 8+, with 3 double bedrooms and a master with en-suite shower-room, a bunk-bed room, family bathroom, separate upstairs and downstairs WCs, a well-equipped kitchen and utility room and a large living area. 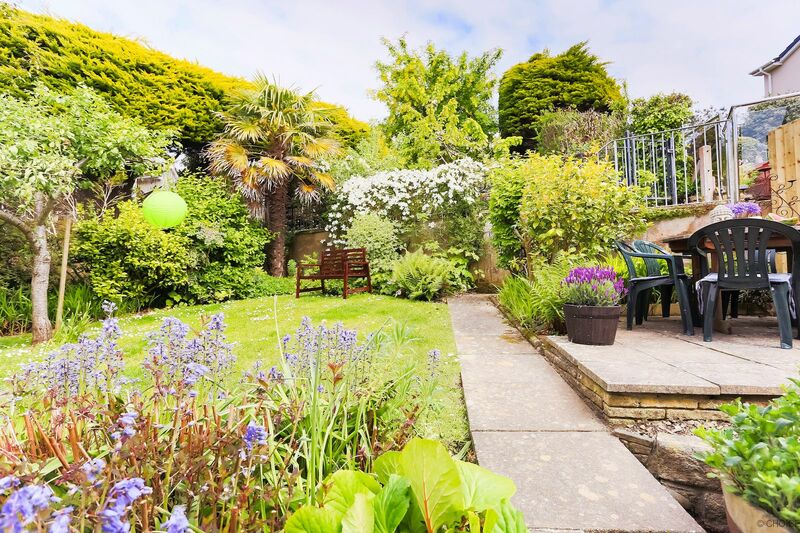 This home offers some of the best views in Croyde and surrounding countryside, particularly from the beautifully manicured garden, which extends away from the house over multiple levels. THE WHITE HOUSE offers an ideal home for larger families, two families or groups of friends with parking for 2 cars on the driveway. 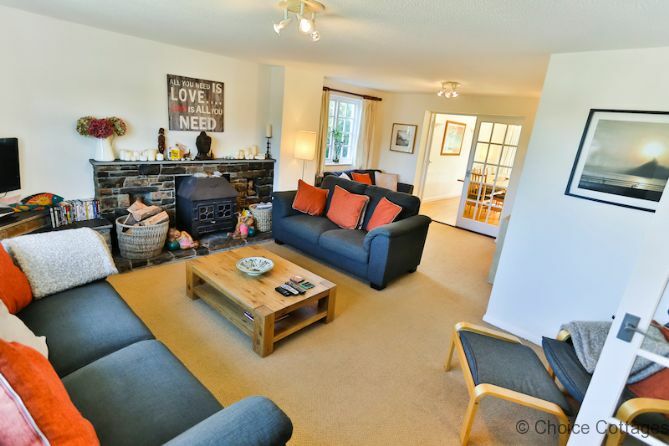 As you enter this spacious home, you are welcomed by the very large lounge to the left. The lounge is L-shaped, dividing into 2 separate seating areas with walls decorated in fresh white throughout and hard wearing neutral carpets. This is a double-aspect lounge with one window overlooking the front garden and the other window looking to the side of the property. 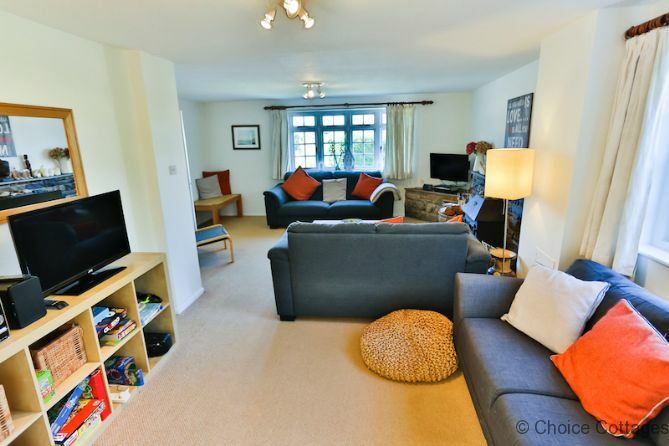 Within this lounge area there is ample seating with 3 sofas and an armchair. 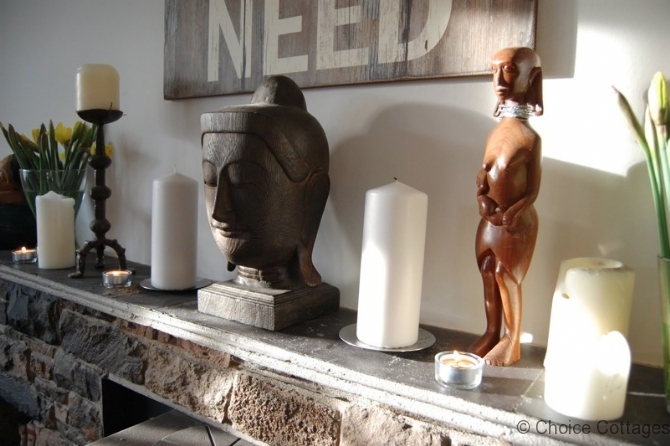 Area 1: This part of the room has a comfortable, warm ambiance. 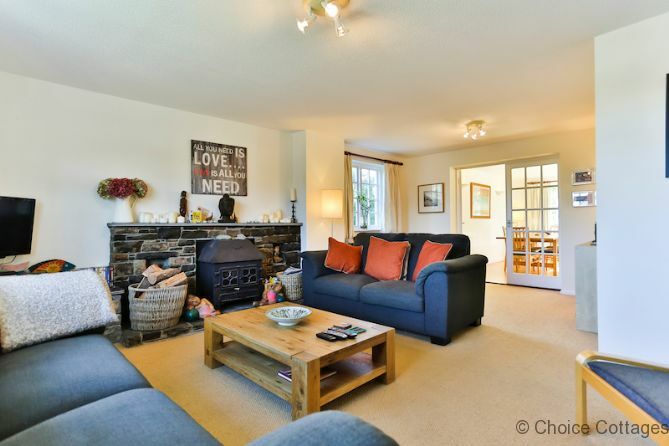 There are 2 comfy sofas with co-ordinating cushions either side of the wood burner and its attractive surround. There is also a contemporary casual lounge chair and footstool. Between the sofas is a useful low pine table. For your entertainment there is Super Fast broadband (WiFi), full Sky package, a wall mounted flat screen HD TV, and DVD/CD/MP3 Player . 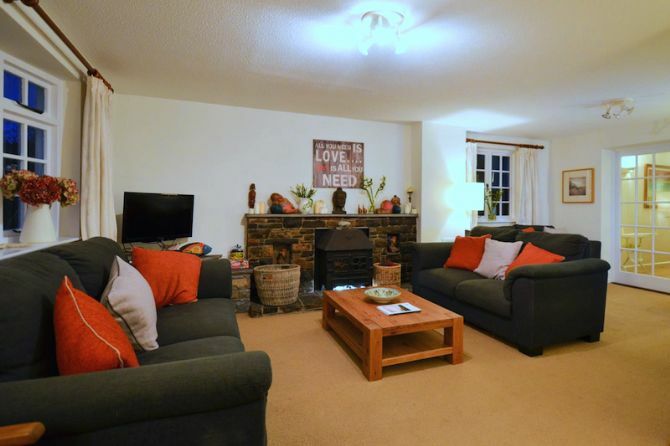 All enjoyed while relaxing on the sofa with a glass of wine and the warmth and comfort of the crackling wood burner. Area 2: Contains a double sofa. Box shelving can be found opposite the sofa, with a pine mirror over. The addition of a flat-screen TV is great for those wishing to bring along their games consoles for rainy day entertainment, whilst others watch the TV in the main lounge area. On top of the shelving is a compact DVD/CD/MP3 player together with a welcome folder containing useful information. The lounge flows effortlessly to the double aspect dining room: With solid oak flooring, central ceiling light, white painted walls with french doors giving you access to the patio area at the rear of the property. 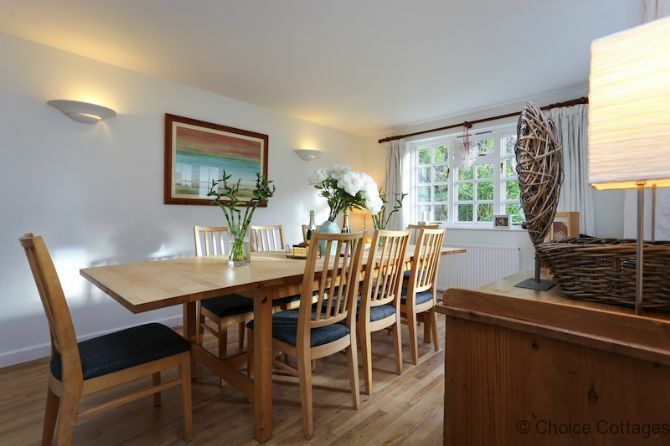 There is a large oblong table with seating for 8 people.There is also a wooden chest housing the table mats, ‘where to go’ leaflets and some lovely John Lewis Crockery (plates & bowls). 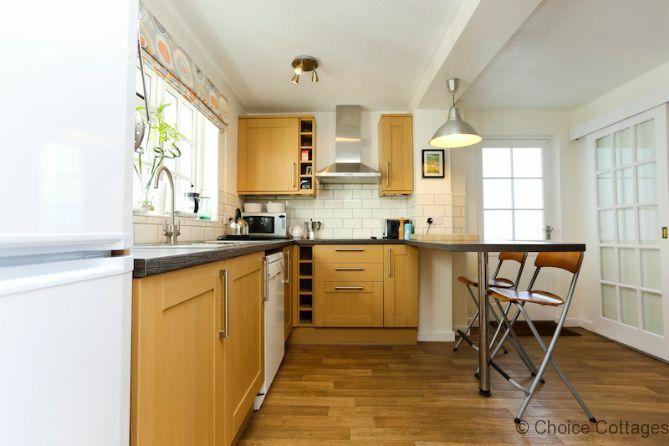 Kitchen: The kitchen is modern and airy and has been designed for easy access and movement, complete with breakfast bar-counter with 2 bar stools. 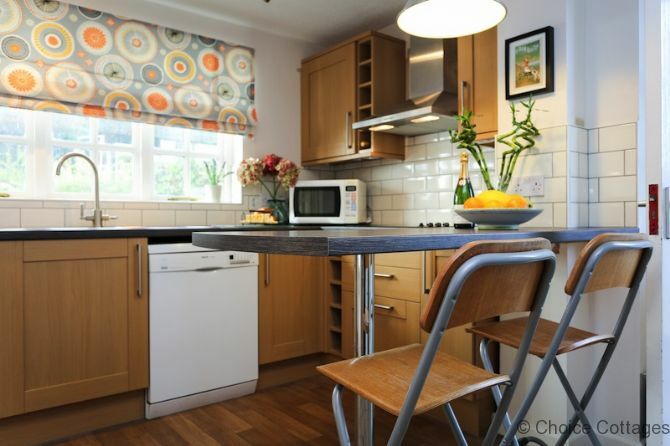 A well-equipped kitchen with all the features one would expect, including a 4-ring electric hob, built in double-oven and grill, extractor fan, 4-slice toaster, microwave, kettle, breadboards, stainless steel cooking utensils, dishwasher, large fridge/freezer and cafetiere. There is a plentiful supply of crockery, pots and pans, glassware, mugs and a useful supply of children's beakers, plates, bowls and spoons. 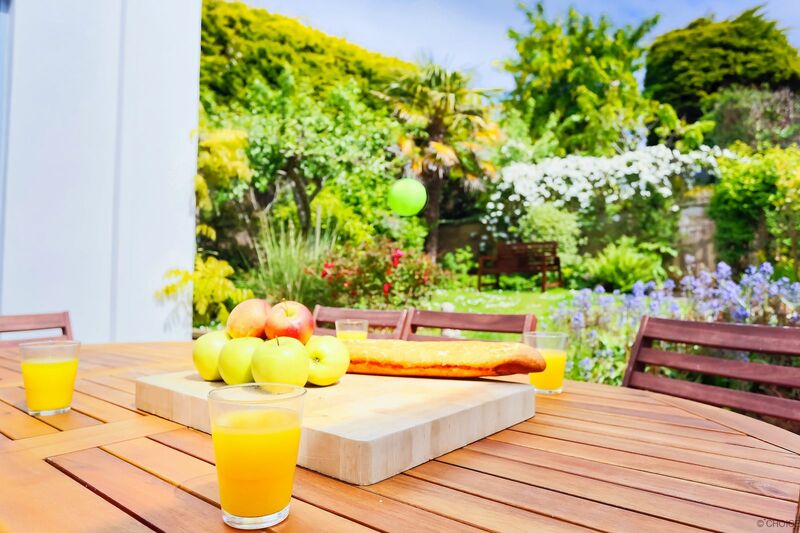 Your cooking experience will be enhanced by the lovely views over the garden. Next to the kitchen, off the hallway, is a useful storage cupboard housing iron/ironing board, broom, hoover, dustpan and brush and coat hooks. 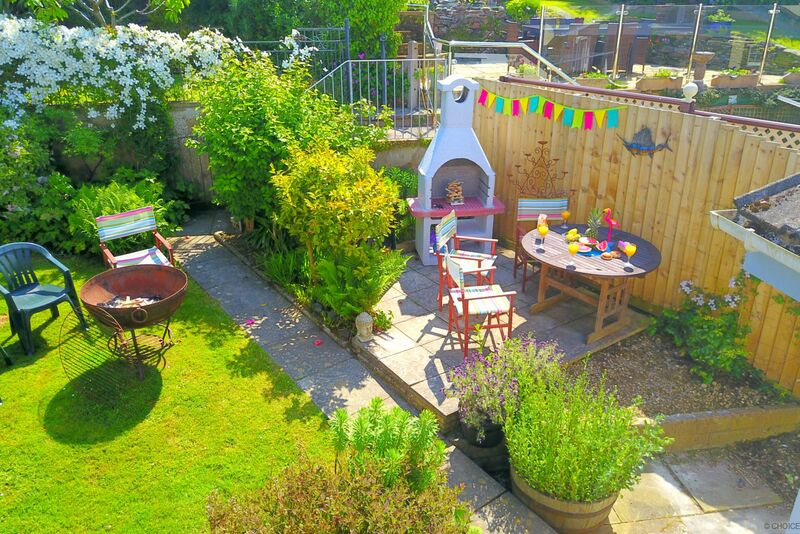 Utility Room: There is a separate utility room off the patio area complete with an additional stainless steel sink and drainer, fridge/freezer, washing machine, tumble drier and clothes airer. 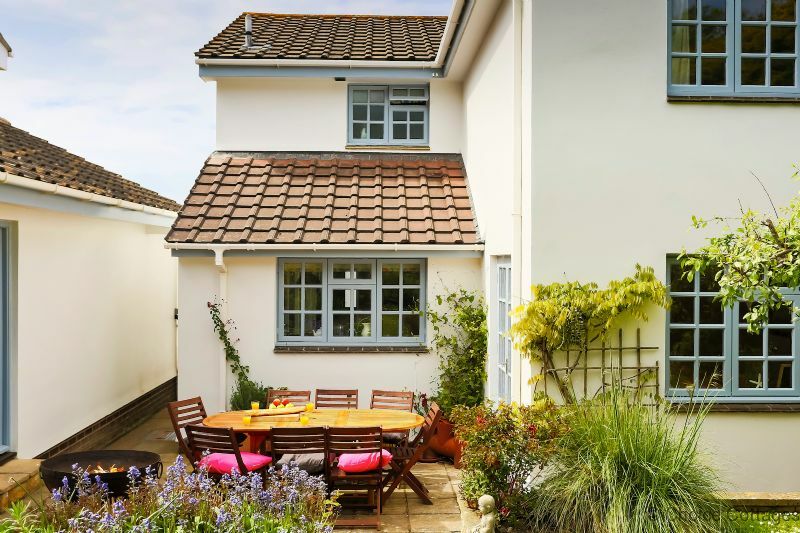 There are also some useful extras including mop and bucket, broom, step stool, garden chairs, cushions for the garden chairs and linen basket. Bedroom 1: (Master Bedroom with en-suite shower-room). 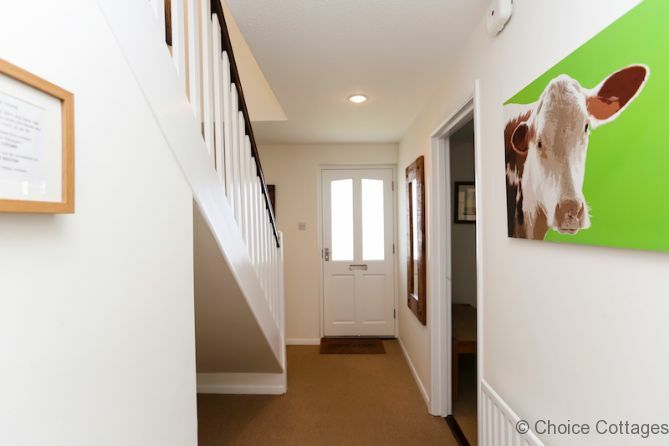 At the end of the upper hallway is the Master Bedroom with en-suite shower room. The bed is king-size flanked by modern bedside cabinets, a matching 6-drawer chest of drawers, a large wardrobe with shelves and hanging space and a long wall-mounted mirror. 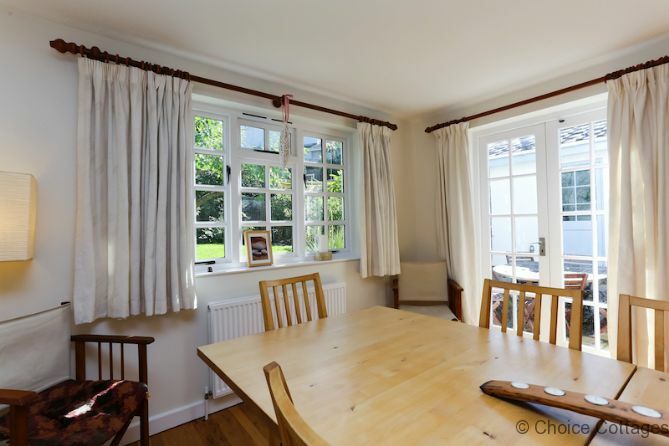 This is a single aspect room with a large window overlooking the stunningly pretty back garden. Bedroom 2: (Bunk Beds). 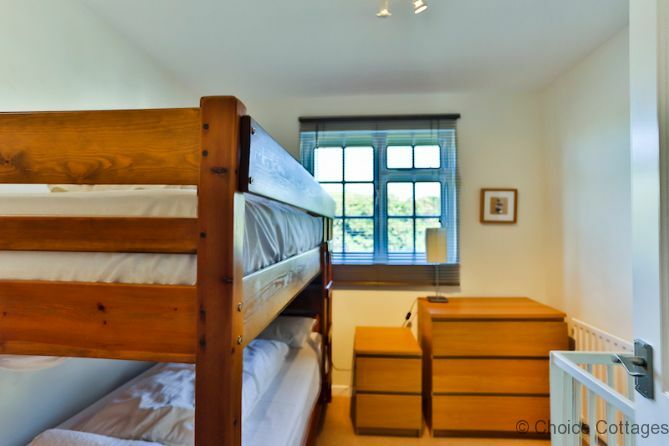 Within this bedroom is a set of pine wooden bunk-beds and a wooden cot in white, perfect for young children. A 3-drawer chest of drawers, bedside cabinet and bedside light provide storage. This is a single aspect room with a window overlooking the side of the property and the green hills beyond. Wooden venetian blinds at the window add the finishing touch. Bedroom 3: (Twin Bedroom). 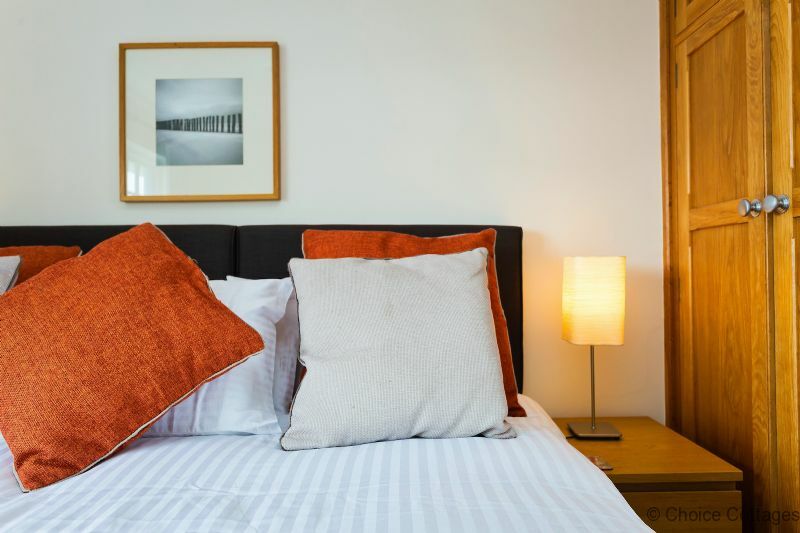 Two 3' single beds that can be zip-linked to make a king size double bed, 2 bedside cupboards with table lamps, a massive full-length fitted wardrobe, 1 mirror fronted single wardrobe with cupboards over and 6-drawer chest of drawers with mirror over and a hair-drier. 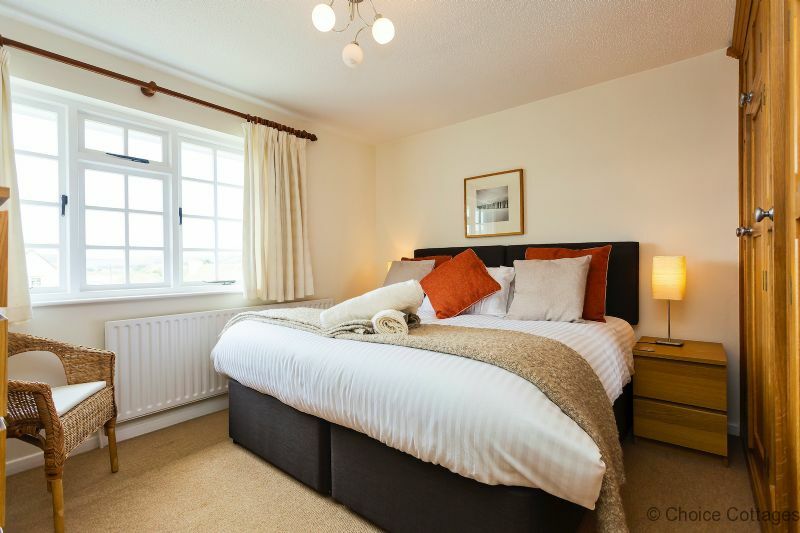 This is a single aspect room with a large picture window giving a view over the rooftops of Croyde to the sea. Bedroom 4: (Twin Bedroom). 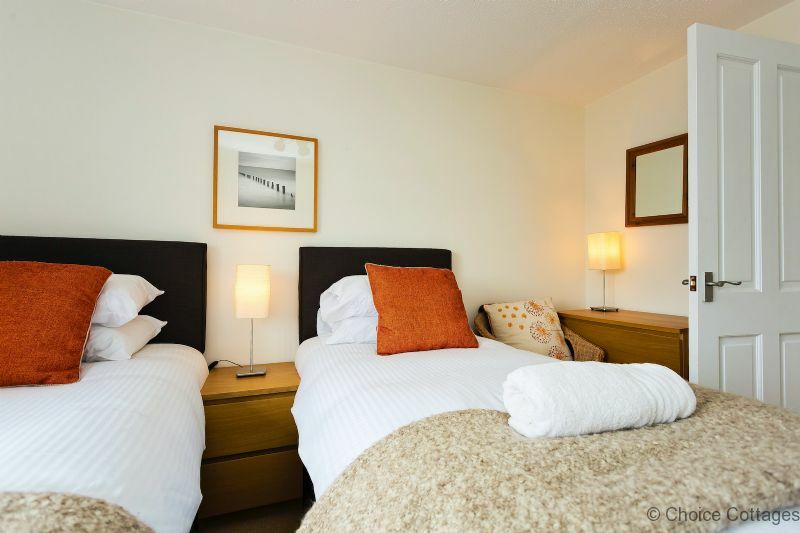 Two 3' single beds that can be zip-linked to make a king size double bed, A large bedroom with bedside tables and lamps, a 6 drawer chest of drawers and a built in cupboard, currently housing a z-bed, spare duvets and pillows. 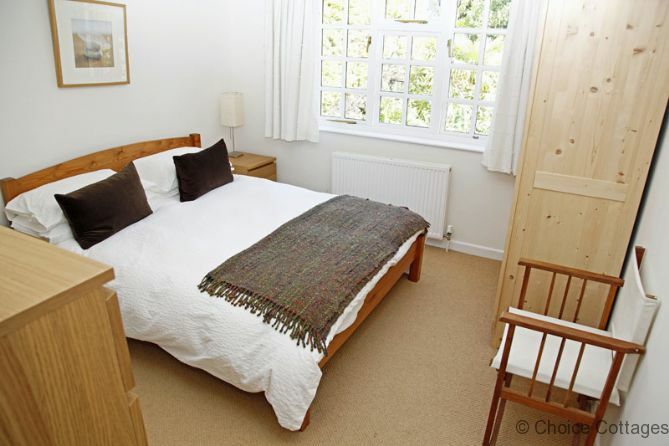 The room has a large window with wooden venetian blinds, overlooking the front of the property. The WHITE HOUSE has an en-suite shower-room off the master bedroom, a family bathroom, a separate upstairs WC and a downstairs WC. The garden of the WHITE HOUSE has to be seen! 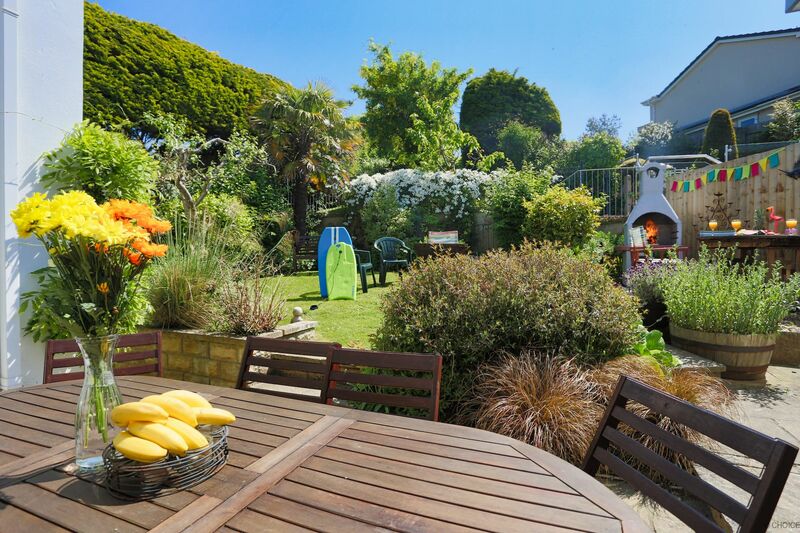 Creatively landscaped on 3 levels, it is a ‘garden lovers’ delight. Children will love the 'secret' area at the top. 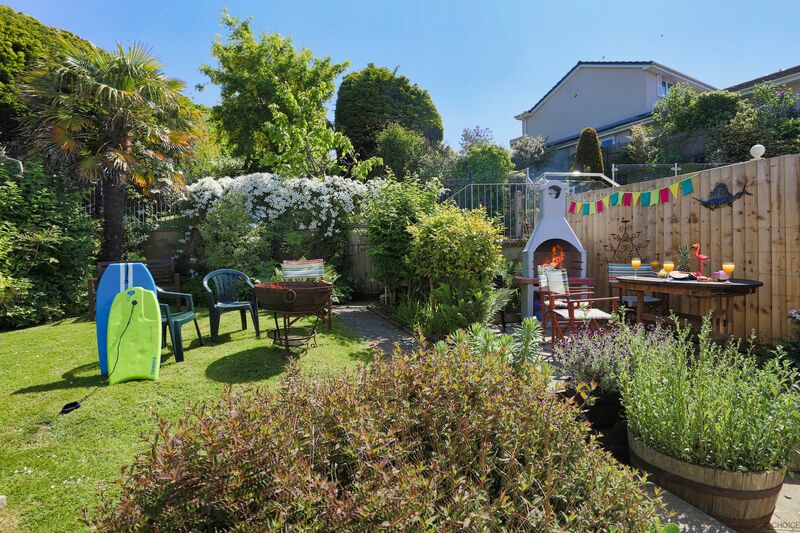 This beautifully planted, fully enclosed and private garden provides plenty of space for play, relaxation and outdoor entertaining There is a paved area reached from the dining room, complete with table, chairs and parasol, while further up the garden is another seating area with a Kadai fire bowl/BBQ. Up yet another level and to the rear of the garden is a gorgeous Wendy House, beautifully kitted out for the children to enjoy. Parking is well catered for in front of the house with space for 2 cars. 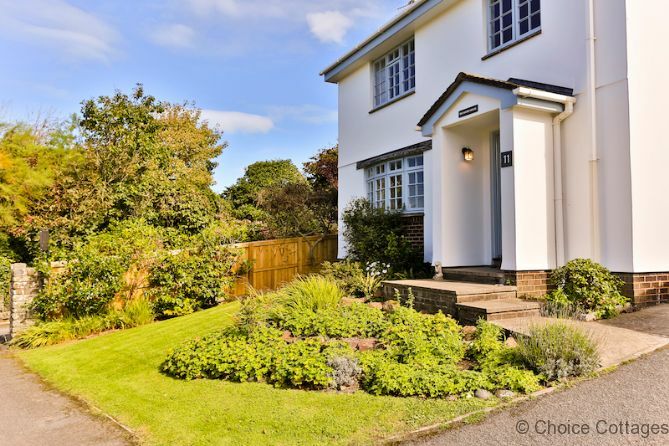 DRIVE TO – explore the beautiful Exmoor National Park. Combe Martin Wildlife and Dinosaur Park, The Milky Way and The Big Sheep all within a short driving distance. 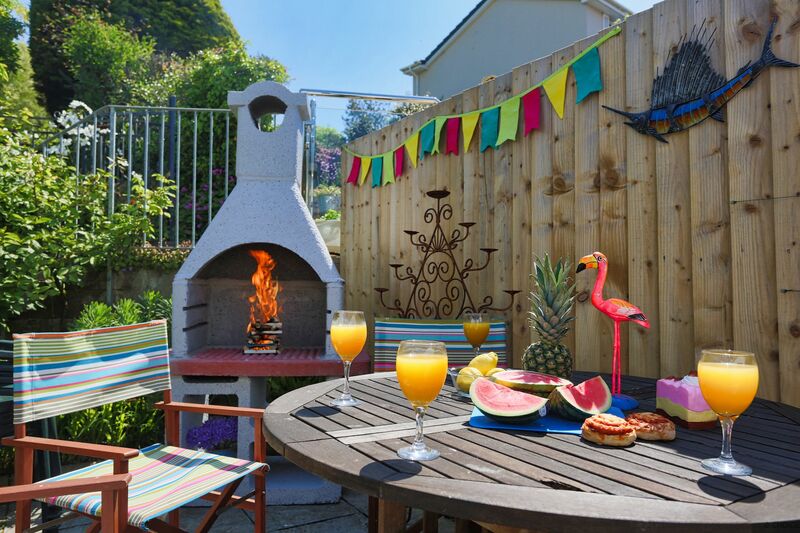 Cultural days can be passed at Arlington Court, historic Clovelly Village, Watermouth Castle, Lynton, Lynmouth, Victorian-styled Ilfracombe with its quaint fishing harbour and many more. Saunton Golf Course is a mere 3 miles down the road with its 2 famous links courses. 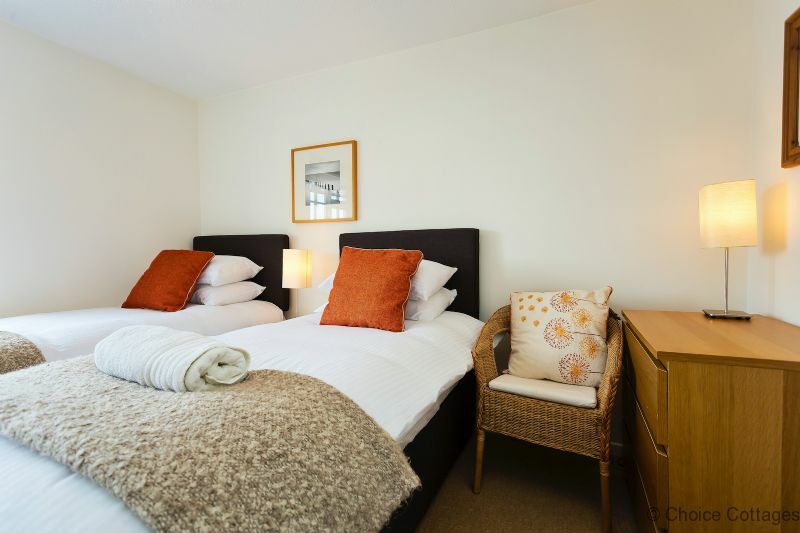 Finally, picturesque walks through beautiful forested areas and running rivers such as at Watersmeet will complete your wonderful stay in this beautiful part of England. 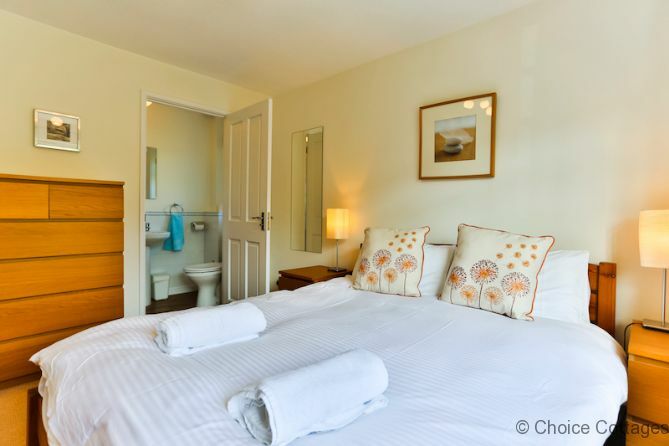 PETS - North Devon features five all year round pet friendly beaches. Excellent family weekend. Location is incredible! Perfect for dogs in the garden. All round fantastic! This was a fab find for our family New Years get away. A family of 4 adults and 4 teenagers stayed here very comfortably. 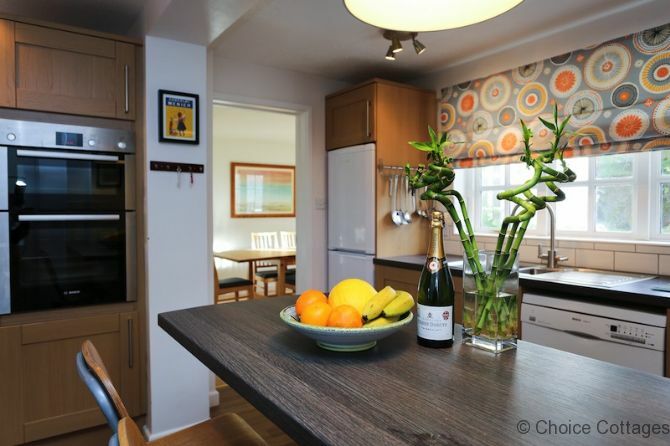 The house was how I had hoped: Cosy but spacious, very clean, quality kitchen wear, and comfortable beds! 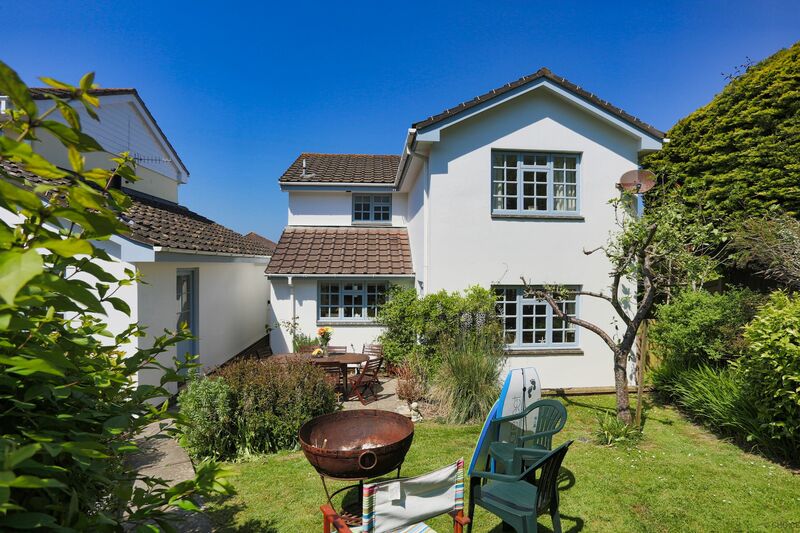 The location is excellent and within a short walk to the local pubs. The beach (Croyde Bay) was a bit further away than we had anticipated, about a 20min walk but there is a car park at the beach for any rainy days. It’s a beautiful house. We would most definitely return again! 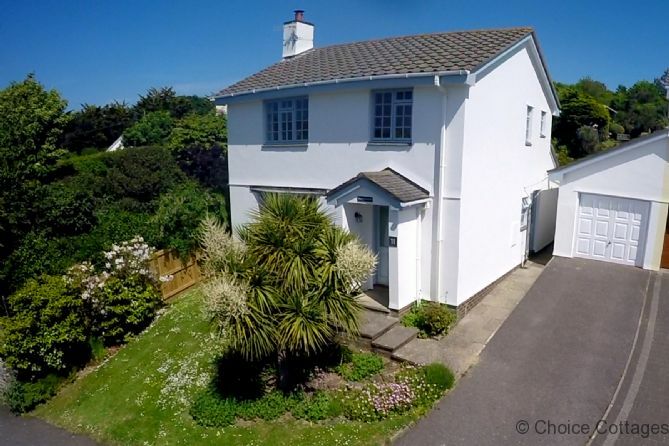 Had a fantastic time at Croyde White House, everything you need even essentials i.e.-washing up liquid, dishwasher tabs, bins, all cleaning materials you could ever need, I could go on. Great location just a few mins walk at the lane past Billybuds to a field to walk dogs & paths to beach (unfortunately no dogs allowed on Croyde beach). Lovely food & service at all the pubs/restaurants, lovely surf shops etc. would definitely go back, missing it already. 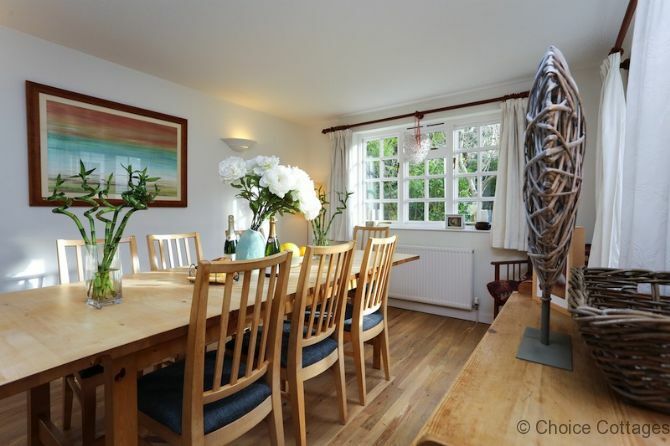 Stayed at Croyde White House over the new year period with another family. House was clean with enough kitchen equipment to use. There is a wood burner in the living room which we made use of on the cold days after a good walk. Rooms were good sizes and there was plenty of hot water available for showers. 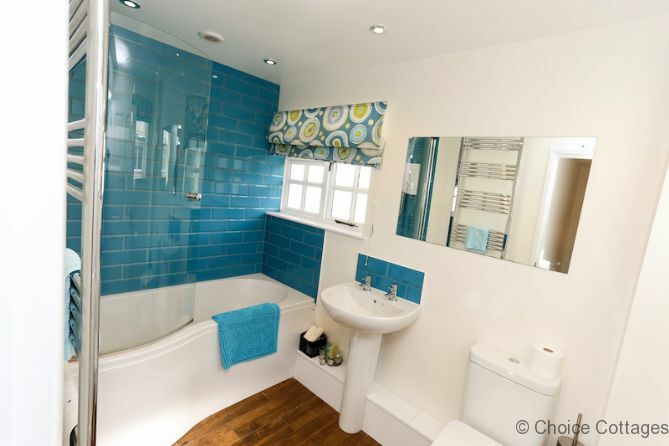 The main bathroom looked like it had been renovated recently. White House is a stones throw from walks in the area and the beach but more importantly Billy Budds and the Thatch! We have already booked for New Year. 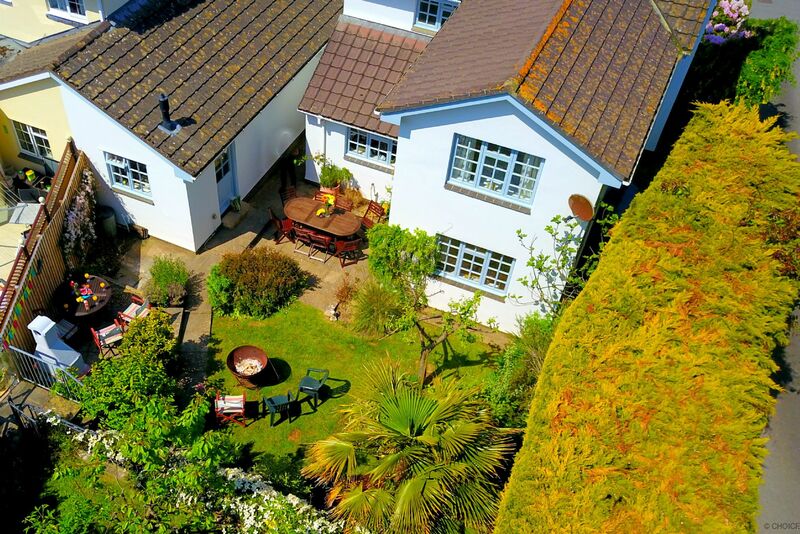 We have just returned from 4 nights in The Croyde White House. The house itself is beautiful and extremely well equipped. They really have thought of everything. 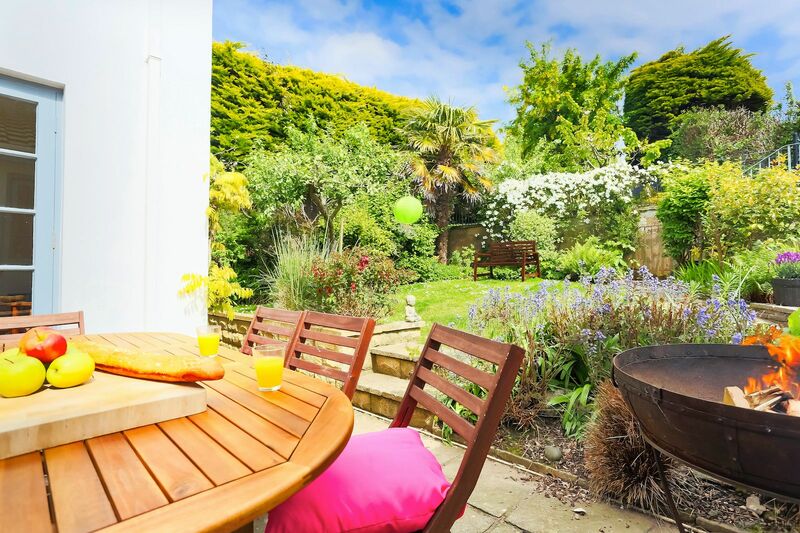 The location is perfect with a 2 minute stroll into the village and a 5-10 minute walk to the beach. 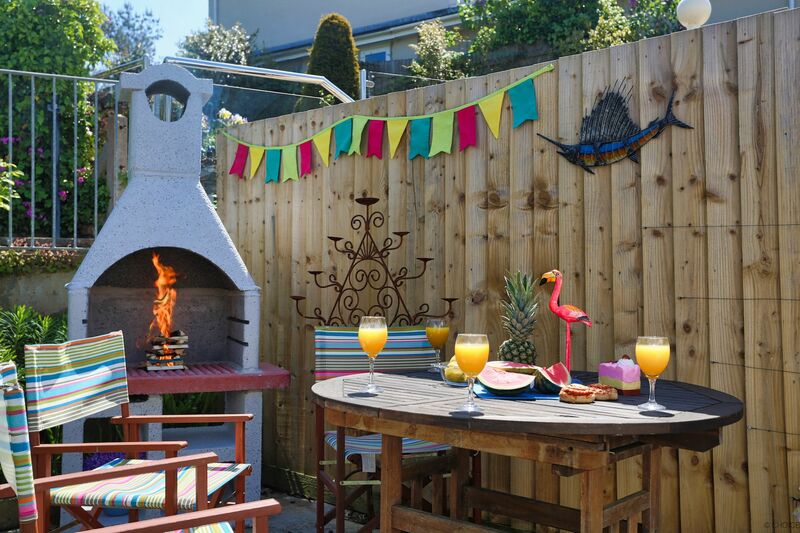 We highly recommend this house and cant wait to go back. 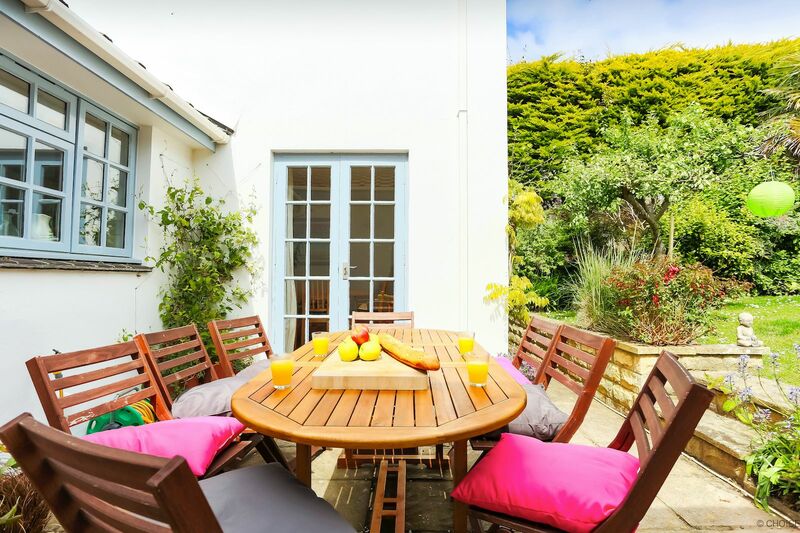 "We have just returned from a stay at the White House in Croyde, we had a lovely time, thank you! 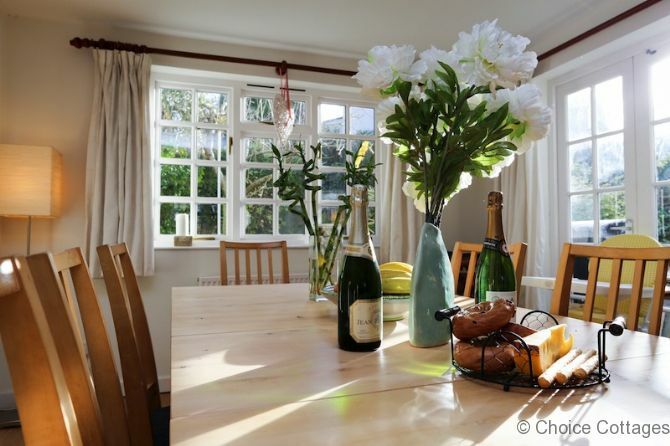 The kitchen was well equipped and the house had all the amenities you would need including a lovely log burner, excellent for a winter break."